Our management agenda 2015 was based on the key focus areas we had defined in our business plan 2015-2017, coupled with our strategic pillars. We formulated twelve objectives, of which we realised eight in full and four in part. We provide additional information about our results achieved in 2015 on the basis of the most important material topics. The reliability of gas transport has a high priority within our company. In 2015, we achieved almost 100% security of supply. There were three short interruptions in our Dutch network. In one of these cases, one end user received no gas for a short time. There were no interruptions in our German network. We investigated the causes of these transport interruptions and drew up points for improvement to reduce the risk of interruptions to zero. In 2015, the total volume of gas transported through our network decreased to 1,179 TWh (2014: 1,233 TWh). In the Netherlands, less natural gas was transported than last year. In 2015, we transported 935 TWh (95.7 billion m3) of gas for our customers through our network for the benefit of end users in the Netherlands and abroad (in 2014: 976 TWh). This decline is due to the fact that less gas was exported. In Germany, the transported volume also declined, from 257 TWh in 2014 to 244 TWh (24 billion m3) in 2015. In January and February, we saw clear changes in the transport flows in the northern German networks. There was little inflow from Russia via Nord Stream, while there was more inflow from Norway and the storage facilities. However, in early March the situation changed: the inflow via Nord Stream was continuously at or around the maximum technical capacity, and only decreased during planned maintenance periods. In 2015, Nord Stream transported a record volume of 39.1 TWh. This is over 10% more than in 2014. Just over 32 TWh was transported via the Bacton-Balgzand pipeline (BBL) in 2015, compared to 72 TWh last year. To mitigate the consequences of the reduced gas production from the Groningen field, the use of our quality conversion capacity rose significantly in 2015. Through quality conversion, high-calorific H-gas is mixed with nitrogen and converted into a quality that is similar to the low-calorific G-gas. As a result, we could continue to meet the demand for G-gas. The volume of converted gas rose from 4.8 billion m3 in 2014 to 16.9 billion m3 in 2015. In order to make sure we can continue to meet the (mainly domestic) demand for G-gas in the future, we need to expand the nitrogen capacity in the Netherlands. We are therefore planning to expand the existing nitrogen installation near Zuidbroek in Groningen. On the basis of current insights, this will enable us to make sufficient conversion capacity available to our customers as of 2020. Click for a larger view of the infographic. Due to the steadily declining German and Dutch production of L-gas, Gasunie Deutschland is arranging the market conversion from L-gas to H-gas. The first pilot project (‘Schneverdingen’) was successfully completed in October 2015. In this project, we worked together with various partners from the energy chain, such as ‘Stadtwerke’ and regional network operators. The next few conversion projects have already been announced, and the relevant agreements have already been entered into with the neighbouring network operators, completely in line with the German network development plan (the Netzentwicklungplan or NEP). For the fourth year in a row, the throughput of LNG increased. In 2015, the number of unloaded ships increased to 21 (2014: 14). In addition, the number of loadings of large tankers doubled to 14 (2014: 7), while the number of loadings of ‘small-scale tankers’ (up to 20,000 m3) rose from 13 in 2014 to 14 in 2015. The number of loaded trucks and containers rose sharply to 788 in 2015, compared to 174 in 2014. In November, for the first time more than 100 trucks were loaded in one month. On 14 January 2016, the 1000th truck was loaded with LNG. This important milestone was reached within two years of the opening of the truck loading facility. In the meantime, the construction of a second loading platform has already started. The market for gas storage services has deteriorated significantly recently, due to strong growth in seasonal storage capacity. Although EnergyStock, thanks to its fast-cycle nature, offers specific options that distinguish it from the competition, this development had a negative effect on EnergyStock’s results in 2015, particularly in terms of the sale of free capacity. We aim to make maximum use of EnergyStock’s distinctive profile to create opportunities even in difficult market circumstances. That is why EnergyStock, in consultation with market parties and on the basis of its specific positioning, developed a new service package in 2015. This package was introduced to the market at the end of 2015, which means it will be available in 2016, when a lot of EnergyStock’s capacity will become available due to the termination of an existing contract. In 2015, a lot of work was put into the construction of a Truck Unloading Facility (TUF). Through this facility, LNG can be delivered by truck to fill up the tanks. Depending on economic circumstances and the availability of LNG, both the TUF and the liquefying installation will be used in the future. To ensure an undisrupted and safe gas supply, we want our infrastructure in Groningen to be more earthquake-proof. Research shows that gas transport through these pipelines under current circumstances is not at risk, but if the maximum strength of the earthquakes increases to 5.0 on the Richter scale in the future, this can not be proven. That is why it has been decided to make preventive adjustments to this part of the pipeline network. These adjustments will involve upgrading and partly replacing approximately 80 km of regional transport pipelines and taking construction measures at ten stations, ensuring they meet the new requirements. In 2015, we worked out the measures to be taken in more detail, and took a positive decision. The ‘quick wins’ were then carried out immediately. In 2016, a start will be made on the implementation of the other measures, which are expected to be completed by 2020. In September 2015, the new 64-kilometre pipeline between Fockbek and Ellund was put into operation according to plan. This pipeline provides for the increasing demand for capacity in northern Germany. The completion of the new compressor station in Quarnstedt was delayed due to heavy rainfall, which meant it could not be put into operation in October 2015. The compressor station is expected to be ready for use in the first half of 2016. Any agreements following from transport contracts that relied on the compressor station being operational will be met by means of commercial agreements. According to plan, the new Elbe culvert was put into operation in April 2015. This culvert is of major importance for gas transport to Hamburg, Schleswig-Holstein and Scandinavia. In addition, it is important for the Scandinavian telecom market. The old culvert was completely removed in September. In 2015, a start was made on replacing the software used for monitoring and operating GTS’s gas transport network. The current system, which was developed in-house, has been in use since 1993. Replacement is not only necessary due to the age of the system, but functional requirements have also changed. The system will be replaced by a combination of standard and customised software. The new software is expected to be operational in 2018. As of 1 January 2016, GTS was split into two separate companies: GTS for the national main transport system (HTL) and Gasunie Grid Services (GGS) as network operator for the regional high-pressure system (RTL). This split will enable GTS to make a further move in serving the market more effectively. The role and focus of the HTL and RTL transport systems will increasingly diverge. For example, the internationally connected HTL system will increasingly be confronted with European market integration, while the RTL system will increasingly focus on maintaining the regional network and on the connections with the regional high-pressure system. The development of sustainable energy solutions will also mainly take place in the RTL network. The split will in due course enable costs and tariffs to be determined in a transparent and unambiguous way. This means the two transport systems will be able to apply tailor-made tariffs for their users in the future. During 2016, GTS will remain the dedicated network operator for both the HTL and the RTL network, so that GTS’s existing regulatory method can remain intact for the year 2016. We strive for optimum deployment of our network. That is why good relationships with our customers are essential. GTS, Participations and Gasunie Deutschland are responsible for managing customer relationships. GTS measures its customers’ satisfaction every year through a survey. On the basis of the survey results, improvement actions are initiated. In 2015, GTS carried out a customer satisfaction survey to help us align our service provision with customers’ wishes and needs. To encourage participation, we gave a donation to the Red Cross for each survey completed. In this way, we contribute to an important social organisation. Eventually, 139 of the 458 customers completed the survey. We are proud that, in 2015, our customers gave us a higher rating than last year. Shippers gave GTS a mark of 7.8 (2014: 7.6) and industrial customers gave GTS a mark of 7.5 (2014: 7.3). Customers indicate that they appreciate the speed of response, the way GTS thinks along with them, and GTS’s transparency in communications. Almost three-quarters prefer GTS over other Transmission System Operators (TSOs), particularly when it comes to customer focus, transparency and accessibility. An important point for improvement revealed by the survey concerned the user-friendliness of GTS’s website. GTS therefore implemented several improvements in 2015, such as a better search function and a new website structure. These improvements should make it easier for website visitors to find the information they are looking for. At the end of March 2015, Gate terminal started the construction of the new LNG break-bulk infrastructure at its installations on the Maasvlakte near Rotterdam. The new facilities are expected to give a boost to the use of liquefied natural gas (LNG) as a clean and affordable fuel for the transport sector in the Netherlands and north-west Europe. The completion of the installation and the start of the first services are planned for mid-2016. In 2015, we worked with various partners on a number of projects with a specific focus on innovations in the production of renewable gas. Renewable or sustainable gases include green gas derived from fermentation or gasification of biomass and sustainably produced hydrogen. In the future, these gases will play an increasingly important role in sectors that are difficult to make more sustainable, such as heat supply, transport and industrial processes. It is expected that by 2030, two to three billion m3 of renewable gas will be able to be produced in the Netherlands, comparable to the current gas consumption of approximately two million households. To this end, we are working together with Torrgas to develop an innovative gasification technology that would be suitable for the gasification of torrefied (roasted) biomass. Another relevant project concerns the gasification of biomass in the province of North Holland, which we are carrying out together with ECN, Dahlman and Participatiefonds Duurzame Economie Noord-Holland (PDENH). This project aims to enable efficient biomass gasification on an industrial scale. A Green-gas Booster makes it possible to transfer green gas from one network to another if there is oversupply in one of those networks. In 2014, we came to the conclusion, together with green-gas producer Attéro and regional network operator Enexis that a Green-gas Booster will be necessary near Wijster in order to transfer the oversupply of green gas in Enexis’s network to GTS’s network. We set up a pilot for this purpose, signing an agreement with these two parties in the spring of 2015. By facilitating large-scale production of green gas, the Green-gas Booster helps to achieve the sustainable energy objective for renewable energy as agreed in the Energy Agreement. The Green-gas Booster is expected to be put into production in 2018. Heat supply in Dutch homes and companies currently relies almost completely on natural gas. In the future, use will increasingly be made of sustainable heat: residual heat from industry, geothermal heat, and heat from green applications, such as solar boilers. These developments are supported and encouraged by the Dutch government, in line with the Heat Vision (Warmtevisie) presented by the Minister of Economic Affairs in 2015. We are currently exploring the possibilities in the field of large-scale heat projects. With partners from the world of energy, large heat consumers and local authorities, we are considering projects that could contribute to the heat supply of the future. In doing so, we want to focus particularly on a role as transporter in the heat infrastructure. The volume of green gas certified by Vertogas again rose significantly in 2015, increasing from 53 million m3 in 2014 to almost 71 million m3 in 2015. This increase was mainly attributable to a few large producers who have their own biomass at their disposal. Since 1 January 2015, the role of Vertogas as certification authority for renewable gas (green gas) has changed. As of 1 January, Vertogas acts on behalf of the Minister of Economic Affairs, and carries out its task on the basis of the new energy legislation, which also includes certification of renewable energy. Through its certificates, Vertogas confirms the green origin of renewable gas from biomass. Our activities are subject to laws and regulations. For example, we need to comply with the Dutch Gas Act, and large parts of our activities in the Netherlands and Germany are regulated. Various departments of Gasunie, Gasunie Deutschland and GTS are responsible for ensuring that we comply with all relevant laws and regulations that apply to us, such as the Legal Affairs, Regulation and Land Matters departments. We monitor developments in the field of laws and regulations, and ensure that we act in a timely way on relevant changes. With regard to our regulated activities, we provide input to the regulatory authorities, which they use to determine the tariffs for the coming regulatory period. We implement these tariffs as of the moment that they apply. In 2015, GTS drew up a network development plan (NDP), which replaces the former Open Seasons. The NDP is necessary to ensure sufficient transport capacity for our customers, now and in the future. Because parties in the market are booking capacity at increasingly shorter notice and for shorter durations, GTS has less insight into the demand for capacity in the longer term. The NDP illustrates possible developments affecting GTS’s gas transport network on the basis of a series of plausible energy scenarios. In drawing up the NDP, market parties are consulted. GTS will start preparing a new investment plan to be drawn up and submitted to the Authority for Consumers & Markets (ACM) and the Ministry of Economic Affairs in 2017. In 2015, ACM started preparing the regulatory method for 2017 and beyond for GTS. As far as possible, ACM strives to treat the various network operators in the same way. This can make it difficult to get issues that are only relevant to a national network operator on the agenda, such as the costs of quality conversion. Other important topics are the Weighted Average Cost of Capital (WACC) and the setting of the dynamic and static efficiency of GTS. The draft decision of ACM is expected to come out in April 2016, and the definitive decision is expected in September 2016. The German revenue regulation, combined with increasing fluctuations in short-term bookings, leads to regular tariff changes. BNetzA recognises that it also needs long-term contracts to stabilise these fluctuations. It therefore published its ‘BEATE’ decision in April 2015. This decision makes long-term bookings more attractive again compared to short-term bookings. The related change in the tariff system was implemented on 1 January 2016. In addition, partly on the basis of the input provided by BNetzA, the German Ministry of Economic Affairs (BMWI) is examining the current regulatory framework and possible changes. Any adjustments to the regulatory framework that follow from this review by BNetzA need to be approved by the Bundesrat. Implementation is expected in the next regulatory period (as of 2018) at the latest. Energy users benefit from strong international gas connections and a liquid gas market. This has a positive effect on the availability of gas, and on efficient and reliable pricing. In 2015, the Netherlands was again one of the most attractive and liquid gas trading markets in Europe. Thanks to the gas roundabout, the country has a well-functioning gas market, with healthy competition, which leads to lower gas prices. The Dutch virtual gas trading platform TTF (Title Transfer Facility) has grown fast. Together with the English National Balancing Point (NBP), it is currently leading the field in Europe. Despite the declining demand for gas in north-west Europe, more volume was traded on TTF in 2015 than ever before. The bilateral Over-The-Counter (OTC) trade again showed strong growth, which meant that TTF was able to strengthen its No. 1 position in the European OTC market, a position it had reached in 2014. In addition, the TTF volume traded via gas exchanges more than doubled in 2015 compared to 2014. In total, over 25% more gas was traded via TTF in 2015 (16,684 TWh) in comparison with 2014 (13,216 TWh). The physical volume flowing through the GTS network via TTF (the net TTF volume) was 450 TWh in 2015, compared to 430 TWh in 2014. This means that, just as in previous years, the physical TTF volume is larger than the domestic gas consumption in the Netherlands. 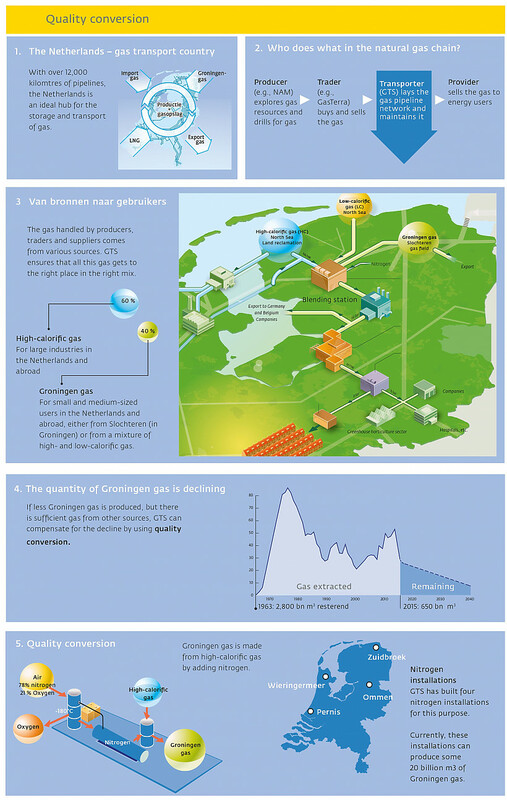 Both the Netherlands and other countries use TTF to meet their demand for gas. The maximum number of active TTF traders on a single day again increased in 2015. At 138, this number was well above that of last year (127 in 2014). In 2015, the volume traded on the northern German virtual gas trading point GASPOOL increased by approximately 16% compared to the same period in 2014 to 1,494 billion kWh (2014: 1,291 kWh). There were 402 active traders on GASPOOL in 2015 (2014: 398). As an exchange for spot gas and derivatives markets, ICE Endex facilitates, among other things, the trade flows on TTF. In 2015, ICE Endex increased its market share in its primary market (TTF Futures) from almost 20% at the beginning of the year to over 25% towards the end of the year. Combined with a strong year for the TTF Futures market as a whole, this has led to a significant increase in the traded TTF Futures contracts via ICE Endex. This has also strengthened the position of TTF as the most liquid continental hub and gas price maker in north-west Europe. PRISMA, the platform for auctioning transport capacity, was expanded in 2015. With TSOs joining from Spain, Portugal, Northern Ireland, Croatia, the Czech Republic, Luxembourg, Slovakia and the Interconnector (UK), the total number of participating TSOs is now 37. As of 1 November 2015, the sale of ‘within-day capacity’ started on PRISMA. As a result, the total package of required services for all these TSOs has now been implemented. Our participation BBL Company has been selling all its available capacity via PRISMA since 1 November 2015. The safety of our employees and the environment in which we work is an important factor enabling us to carry out our activities. One priority for us is therefore to create a safe and healthy workplace and to minimise risk to the environment. Because safety is an important indicator of the quality of our work, we want to be among the best international gas infrastructure companies in terms of our safety performance. European benchmarking of similar gas transport companies, carried out by Marcogaz (the representative body of the European natural gas industry on all technical issues), shows that we are already performing well within our reference group, and we strive to maintain this position. In this section, we describe our main safety results. Other safety-related topics are discussed in the annexes and on our website. In 2015, we started a multi-year programme, Safe@Gasunie, to further improve safety awareness with employees and external workers in order to further improve our safety performance. The results of this programme should become visible in our safety performance in the years to come. The number of injuries resulting in absence in the case of our own employees decreased to 2 in 2015 (2014: 4). The number of injuries not resulting in absence was 4 (2014: 5). We also keep track of the number of injuries in the case of our contractors’ employees. The number of injuries resulting in absence in the case of both our own employees and contractors’ employees decreased by approximately 25%, from 11 in 2014 to 8 in 2015. The number of reportables per one million hours worked also went down, from 5.0 in 2014 to 3.7 in 2015. We also record the number of potentially dangerous incidents (incidents that did not result in injury but could have had serious consequences). In 2015, we registered 22 PEs, an increase compared to the 17 PEs in 2014. We carefully analyse these PEs and try to learn from them, because we want to prevent recurrence and possibly serious incidents or accidents. The increase is mainly due increased safety awareness, for which we set up a special improvement programme. In order to carry our activities safely and reliably, we continuously monitor the technical safety of our infrastructure. Our installations comply with all relevant legal requirements and regulations. We inspect our underground pipelines, both on the inside and on the outside. The safety of our pipeline routes is monitored by means of visual and aerial surveys by helicopter. In 2015, these surveys revealed various potentially dangerous situations, which led to immediate action to maintain a safe situation. We want to limit the risks of the uncontrolled release of dangerous substances and/or energy. In the case of gas transport, this mainly concerns natural gas that is transported under high pressure, natural gas condensate, nitrogen and odorant. Our target is zero process safety incidents. Unfortunately, in 2015, two incidents did occur, which we elaborate on in the section ‘Safety: Where can we do better?’ In 2015, we stimulated increased awareness by developing a special training module that focuses on process safety. This module is part of our multi-year Safe@Gasunie programme. In 2015, we took measures at some locations to enable spatial developments near our pipelines. These measures depend on the local circumstances and vary from supervising operations to applying extra protection above pipelines. Excavation works are the main cause of damage to our underground pipeline network. We take many measures to prevent our pipelines being damaged, so that we can transport gas safely and reliably. Should there be any damage to our pipelines in spite of our efforts, we will do our utmost to prevent gas leaks. In the Netherlands, there were five incidents of pipeline damage in 2015 caused by mechanical excavation works. In none of these cases did any gas leak into the air. In 2014, there were three such incidents, none of which involved a gas leak. At Gasunie in Germany, as in 2014, there were no incidents of pipeline damage in 2015. Safety: Where can we do better? We go to great lengths to make sure that our safety performance is excellent. We therefore always ask ourselves where we can do even better. Remarkably, in three of the five incidents of pipeline damage in 2015, we were ourselves supervising the operations carried out by third parties. We thoroughly investigated what went wrong. This revealed that both the training and the skills of the employees involved could be improved. We therefore adjusted the supervision with regard to these kinds of operations and set up a multi-year training programme. In 2015, two serious process safety incidents occurred. At our installation in Ommen, overpressure caused the failure of an underground condensate tank. After this incident, we immediately decommissioned all identical condensate tanks and started a thorough investigation to prevent similar incidents in the future. We are still in the process of examining the natural gas condensate system applied; if it turns out to be necessary, we will adjust its design. No one was injured during this incident. During the second incident, high pressure caused a temporary venting pipe at our installation in Scheemda to suddenly come loose and start flying around. This happened because the venting pipe had not been fixed properly following an incorrect risk assessment. During this incident, one of our employees suffered a head injury. This incident has led us to adjust our way of working in these kinds of operations. As a result, the use of similar constructions is no longer allowed. All learnings will serve as input for our multi-year programme in the field of safety. To take the safety awareness of our employees and contractors to an even higher level, we started the ‘Veilig werken? Zeker weten!’ campaign (Working safely? Of course!). If our employees detect an unsafe situation or observe unsafe behaviour, they should take action. In 2015, both our own employees and employees of third parties working for us were able to mention good examples of personal intervention. We registered almost twenty reports. Some of our business activities have an impact on the environment. These include the construction and maintenance of pipelines and installations, as well as the pressurising, transporting and blending of natural gas. Such activities require energy, and that brings with it the occurrence of emissions. In addition, we use certain substances to ensure the safe functioning of gas transport installations. The activities in our offices also affect the environment, albeit to only a limited extent. We do everything in our power to minimise the impact of our own business activities on our environment (our footprint). To guarantee that we take the environment well into account in relevant business processes, we have an environmental management system that is certified to the ISO 14001 standard. To ensure compliance with this standard, our management system is checked annually by an external auditing agency. In 2015, this again led to a positive result. The Dutch government aims to increase the share of sustainable energy in the Netherlands: by 2050, the energy supply should be completely sustainable. As a state-owned company, we feel a special responsibility in this regard. To decrease our CO2 emissions, we want to use more green energy rather than non-sustainable ‘grey’ energy. That is why, for the past few years, we have been procuring green energy for our offices (approximately 800,000 m3/year). The majority of our electricity consumption, however, derives from the operation of our installations. On an annual basis, we use approximately 538 GWh of electricity, mainly for driving our compressors. To place that number in perspective, it is the same as the city of Groningen uses every year, and approximately 0.4% of the domestic electricity production in the Netherlands. Our electricity consumption is likely to increase further in the future, as we will need more electricity for the production of nitrogen. We currently use ‘grey power’, generated using fossil (i.e., non-renewable) fuels. The reason why we have not yet ‘greenified’ this part of our electricity consumption is the fact that this is very costly. This is a dilemma for us, because as a state-owned company, we want to make responsible use of our resources and not spend them irresponsibly. However, in the interest of a sustainable energy supply, in 2015, we decided to also start greenifying this part. As of 2016, we will make annual steps of 20%, to eventually arrive at 100% green electricity from European production. We will do this by buying COs (Certificates of Origin). Our total CO2-equivalent emissions were higher in 2015 than in 2014 (665 kilotonnes versus 548 kilotonnes). This increase was mainly due to an increase in the amount of nitrogen we produced ourselves and the amount of nitrogen we purchased. As of 2013, we have been reporting in accordance with the standard of the Greenhouse Gas Protocol (GHG Protocol). This protocol for greenhouse gases distinguishes various categories (scopes), ranked according to the origin of the greenhouse gas. Scope 1 includes all emissions that are a direct result of our own activities (e.g., the CO2 emissions of gas-fired compressors and engines used for compression, and our own gas consumption for heating buildings and for the boilers at gas receiving stations). Scope 1 also includes the CO2 equivalents from methane emissions, and the emission of hydrofluorocarbons (HFCs), which are used in cooling processes. 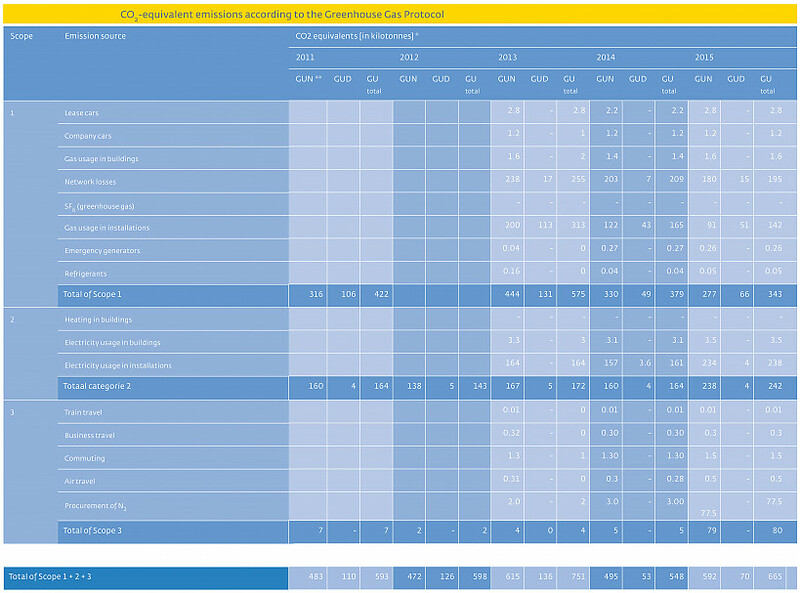 Scope 2 includes the indirect emissions of energy we have procured (e.g., from an electricity company). In our case, the CO2 equivalents in Scope 2 come mainly from the use of electricity for electrical compressors and for the production of nitrogen. Scope 2 also includes the electricity consumed in our offices and our installation buildings. Scope 3 includes all other indirect emissions resulting from our business operations (e.g., road, air and rail travel and energy required for producing the nitrogen we procure). Click for a larger view of the graph. ** In 2013, a number of network operators in the Netherlands developed a new model for reporting CO2 emissions on the basis of the Green House Gas Protocol. We are applying this model as of the year under review. Since the model is not entirely the same as the model of previous years, our current report only includes the totals of Scopes 1, 2 and 3 when referring to years prior to 2013. By making more use of electrically driven compressors, the CO2 emissions shift from Scope 1 to Scope 2 of the GHG Protocol. In 2015, we achieved our collective footprint reduction target (a reduction of 20 kilotonnes CO2 or more). We are limiting our CO2 emissions in various ways, including by detecting what we call ‘fugitive’ leaks. Our methane emissions in 2015 (7,205 tonnes) were lower than in 2014 (8,111 tonnes). This decrease is mainly due to the fact that, over the past two years, we repaired many small leaks at various installations, thus eliminating ‘fugitive’ emissions. We are doing this as part of an extensive ‘leak detection and repair’ (LDAR) programme. For some years, we have been using a mobile recompression unit which we use to recompress as much as possible of the gas that would otherwise have had to be vented, and transfer it to another pipeline. This reduces the amount of gas vented. In 2015, we recompressed 3.1 million m³(n) of natural gas, which means that we managed to prevent the emission of approximately 45 kilotonnes of CO2 equivalents. We estimate that we saved nearly 0.8 million euros on natural gas costs in 2015 by deploying the mobile recompressor. Together with Enexis, Alliander, Stedin, TenneT, KPN and ProRail, we set up the Fair Infra initiative to ‘greenify’ our networks. Together, we are working on significantly decreasing our periodic energy consumption. We will do this by making more use of sustainably generated energy and more efficient energy transport through our networks. We ourselves have managed to make our transport more efficient by reducing the extent to which we heat the gas flows in the networks. We share the knowledge we have gained in this respect, so that others can also make use of it. Our activities take place for the benefit of and in the community around us. That is why safe and reliable transport and the promotion of efficient gas consumption are at the heart of our policy. Besides carrying out our activities as a gas infrastructure company, we want to do more for society. We do this in various ways, of which we give a number of examples below. In the spirit of being a good neighbour, we sponsor activities and events in the Netherlands and Germany and make donations. We have an internal committee that tests grants and rejections every quarter on the basis of our grant criteria, which we have published in part on our website. In 2015, we spent € 256,459 (2014: € 315,264) on sponsoring (25 projects) and € 12,160 (2014: € 29,065 ) on donations (12 projects). In Germany, among other things, we sponsored the Sportivationstage, a large sports event for disabled children, in which more than 4,700 school children participated. Colleagues from Gasunie Deutschland also volunteered to help organise the event. In addition, we sponsor Hannover United, a wheelchair basketball team that was promoted to the first division in 2015. We also donate used materials that are still in good condition to civil society associations, we give presentations at secondary schools and universities, and we regularly open up our head office and catering facilities to relevant organisations (e.g., student organisations). We greatly value our employees’ social activities and in some cases support them in the form of sponsoring. Some of our employees who go to work by bike take part in the Dutch national campaign ‘Fietsen Scoort’. For each kilometre cycled, we donate a certain amount. The proceeds are used to finance sustainable projects in developing countries. In October 2015, in the context of the Sustainability Day of Urgenda, Gasunie organised a Sustainability Week. This week was dedicated to our own activities in the field of sustainability, as well as the way in which our employees can themselves contribute to responsible energy consumption. The programme included a lunch lecture on the energy transition, a trip to energy sustainability pilot platform EnTranCe, and a special campaign to encourage employees to measure and reduce the energy consumption of appliances in their home. We also made heat cameras available to employees for detecting energy leaks in their home. This campaign will continue in 2016, and will be followed by detailed information provision about energy efficiency at home. Within the Energy Valley Top Club, we organize ‘Energy Challenges’. Primary and secondary school children are challenged to set up their own energy-saving and sustainability campaigns at their schools and in their communities. Some 3,800 pupils at eleven schools in the province of Groningen took part in the Energy Challenges 2014/2015. Over a period of seven months, the participating schools saved almost 20% on gas, reducing their CO2 emissions by 29 tonnes. In 2015, revenues declined by € 20 million compared to last year. Higher tariffs resulting from the putting into operation of new assets and additional capacity bookings have only partly been able to offset a partial repayment of revenues from WQA (Wobbe Quality Adaption) services delivered and the regular efficiency discount. The operating result decreased by € 107 million. Besides the aforementioned decrease in revenues, total expenses increased by approximately € 87 million. This increase was mainly due to higher operating costs relating to additional provisions taken for the shutting down and removal of pipeline parts in order to make our infrastructure in Groningen more earthquake-proof, higher maintenance costs relating to GTS’s multi-year maintenance and replacement programme, and higher construction costs as a result of the removal of the old Elbe culvert in Germany. The result after taxation decreased by € 50 million compared to last year. The decrease of the operating result was partly offset by lower financial expenses, a higher result of participations and lower tax charges. The decrease in financial expenses was mainly due to a lower average interest-bearing debt. Thanks to a dividend payment made by our participation Nord Stream of € 28.9 million (2014: € 9.6 million), the result of participations grew strongly to € 71 million. The tax charges are lower due to a lower result before taxation. In 2015, we virtually completed the last few expansion projects for the Dutch part of the gas roundabout. The expansion projects in Germany are currently in the last phase of completion. With regard to new expansion projects, we are anticipating projects that should enable the transition from L gas to H gas in Germany and the construction of a new nitrogen facility in the Netherlands. For the latter, a definitive investment decision will be taken in mid-2016. Besides the projects mentioned above, the main focus in the coming years will be on replacing and maintaining our existing gas transport network and other assets. An important part of these replacement and maintenance investments concerns the investment project Jason, which has already started. In this project, the current IT systems are being replaced by a new gas transport management system. For the coming 3 years, we expect that the annual investment level (replacement and expansion investments) will lie between € 300 and € 500 million. On the basis of current insights, we expect to achieve a lower operating result from normal business operations in 2016. This decrease in the operating result is expected to be mainly due to a decrease in the revenues from efficiency discounts determined by the regulators in the Netherlands and Germany, as well as due to the termination of long-term contracts in the non-regulated part of our business. In addition, new regulation periods will start for GTS (as of 2017) and GUD (as of 2018). It is conceivable that a static efficiency benchmark will then also become part of this methodology for GTS. The regulatory methodology and the underlying parameters determine (to a large degree) the earning capacity of our regulated assets. With regard to the non-regulated part of our business, we will focus in the coming years on optimising the deployment of our existing assets and developing new assets where necessary. In the next few years, we will realise efficiency improvements by means of our ‘Operational Excellence’ programme. This programme aims to keep our operating costs at least stable in the coming years, in spite of an increase in our activities as a result of the multi-year replacement and maintenance programme. Our financial expenses are expected to decrease further in the coming years, which will have a positive effect on our net result. This decrease in financial expenses will be mainly due to a decrease in our net debt position, due to a relatively low investment level and positive operating cash flows. Our net result will therefore decrease less than our operating result. The tariffs that GTS and GUD charge their customers are regulated. They are determined by the regulators in the Netherlands and Germany respectively on the basis of the expected permitted revenues and the expected capacity bookings. If the actual revenues deviate from the expected revenues, the difference is settled in the tariffs of later years. For the energy costs of gas transport, a settlement mechanism also applies. For the sake of completeness, we refer to the description of the business models of GTS and GUD elsewhere in this report. Given the currently applicable IFRS rules, these positions cannot be included in the balance sheet, but will be accounted for in the profit and loss account as soon as they have been settled in the tariffs of the year in question. In 2015, in the revenues in the Netherlands and Germany, repayments to customers were settled of € 15 million and € 2 million respectively. For the year 2015, another € 60 million (approximately) will need to be settled with customers for the two countries (2014: approximately € 5 million) due to a tariff reduction after 2016. Given the settlements from the past and settlements still to be made in the future, the result before taxation reported under IFRS was approximately € 43 million higher in 2015 (2014: approximately € 16 million lower) than if these settlements were to be reported in the year they arose. In 2015, we repaid a bond loan of € 500 million. Given that our operating cash flow was higher than our investment spend and dividend payment, it was not necessary to issue a bond loan of the same size. We therefore issued a bond loan of € 300 million in 2015. This loan has a term of 3 years. During 2015, our current financing liabilities increased from € 697 million to € 1,002 million. This increase was mainly due to the fact that the remaining duration of one of the long-term bonds fell below 12 months. This concerns a bond loan with an outstanding amount of € 700 million (last year, this concerned a bond loan with an outstanding amount of € 500 million). During 2015, besides short-term deposits on the money market, we made frequent use of the Euro Commercial Paper (ECP) programme. The total interest-bearing debt at the end of 2015 was € 3,987 million, a decrease of € 116 million compared to year-end 2014. The balance sheet item ‘Cash and cash equivalents’ amounted to € 65 million at the end of 2015 (year-end 2014: € 48 million). As a result, our net debt position (interest-bearing debt less cash) decreased in 2015 by € 134 million to € 3,922 million. Solvency at year-end 2015 was 55% (2014: 53%). The increase in solvency is due to an increase in equity, while the balance sheet total remained more or less the same. In our financing policy, besides seeking to maintain our liquidity position at an adequate level, we also strive to have sufficient access to financing alternatives and to attract financing as efficiently as possible. To adequately meet these objectives, we make use of the Euro Medium Term Note (EMTN) programme, the ECP programme mentioned above, our own activities on the private money and capital markets, and the long-term committed bank credit facilities. Looking ahead, a € 700 million bond loan will need to be repaid in June 2016. Because we expect a positive cash flow from operating activities in 2016, our long-term financing need in 2016 will be lower than the above-mentioned repayment amount. During 2017 and 2018, we will need to repay bond loans of € 750 million and € 300 million respectively. In 2015, the rating agency Standard & Poor’s raised our long-term credit rating from A+ to AA- with a stable outlook. The short-term rating is A-1+. Moody’s Investors Services long-term credit rating is A2 with a stable outlook, and the short-term rating is P-1. In 2009, we entered into a so-called ‘compliance covenant’ with the Dutch tax authorities, in which we laid down mutual agreements. In line with this covenant, we have set up an internal Tax Control Framework (TCF), on the basis of which we draw up and execute our fiscal policy, fiscal processes and control measures. Our fiscal policy aims to ensure that we pay any taxes due in a timely manner and in accordance with fiscal laws and regulations in those countries where we carry out business operations. In the table below, we show how much we paid in taxes for the most important types of taxes. The difference between the turnover tax paid in the Netherlands in 2014 and 2015 is due to the fact that we made more investments in 2014. As a result, we were able to deduct more input tax (VAT) in 2014. Despite the high level of unemployment in the Netherlands, we are still seeing a shortage in the labour market for technically trained people. The retirement age is moving from 60 to 67. This means our employees and our organisational structure will need to meet new requirements. Robots and machines are increasingly taking over the work of people. These developments require an HR policy that focuses on the sustainable employability of employees. We aim to be a flexible organisation that is able to respond well to a quickly changing environment. We therefore need employees who work in an engaged and productive way, both now and in the future, and continue to add value to our company as sustainably employable individuals. To achieve this as an organisation, we need to know very well what our employees’ interests are. We therefore asked our employees to think along with us about this issue during an interactive workshop. The best three ideas were worked out in more detail in 2015, and two of them have already been put into practice. Other initiatives in the field of sustainable employability for 2016 and beyond specifically include the following two programmes: Mobility (proactively bringing supply and demand together in the field of internal mobility) and Career 5.0 (workshops for employees of 50 and older to help them stay mentally and physically fit and prepare them for a new phase in their career). In addition, all employees are offered a career scan to give them insight into their career opportunities. We believe in the concept of ‘life-long learning’. We think it is important for our employees to be able to develop and pursue personal growth during their careers, as this helps to improve sustainable employability. We offer our employees the opportunity to follow specific courses and training programmes, including tailor-made programmes. In 2015, we spent € 2,837,000 on courses and training programmes. The proposal for a new remuneration policy which we shared with our employees in 2014 met a great deal of resistance, and gave rise to unrest and many questions. Our employees said they did not understand why these changes were necessary, which led to a lack of trust. We took our employees’ concerns seriously and, together with the Works Council and the trade unions, we started to explore ways in which we could make our HRM and employment conditions policy more sustainable. Over the past year, all parties involved have worked closely together, despite significant differences in interests and the loss of trust. Together, we made an effort to arrive at a balanced and future-oriented employment conditions package, based on shared principles, for the next 5 to 7 years. We took account of all potential clashes of interest, including employees’ interest in having as much income security as possible, and the organisation’s interest in having a more competitive remuneration system. In order to arrive at a policy proposal that would be able to count on the support of all stakeholders involved, we collected information from within the organisation at different points in time. We subsequently wrote an advisory report in which input from the organisation and employees was taken into account. These recommendations were discussed and incorporated into an agreement in principle on a sustainable HRM and employment conditions policy. In addition, an investment agenda was set up, which specifies that both the employer and the employees will invest in the sustainable employability of Gasunie’s employees. This unique joint process between employer, trade unions and the Works Council has restored trust and led to respect for each other’s different points of view. Our employees’ pay depends partly on whether collective and/or individual targets are met. In 2015, performance-based pay applied to employees covered by the collective labour agreement and employees in a ‘young development’ scale*. We set targets for those activities that are crucial in helping us implement our strategy: safety, finance, security of supply and corporate social responsibility. These targets are then subdivided into sub-targets, which together add up to a score of 100%. The 100% score is shown below. The targets are described in the table below. If all targets are achieved, employees covered by the collective labour agreement are granted a bonus of € 500 gross. If the targets are not fully achieved, a pro rata bonus is paid out. In 2015, not all collective targets were achieved. On the basis of the results, a bonus of € 375 gross was paid. Part-time employees received this bonus pro rata. For employees with an individual employment contract, besides the above targets, a financial target was agreed: a reduction in net operating costs by at least € 5 million or more (fully achieved) and a return on invested capital of at least 6.7% (largely achieved). We aim for the lowest possible level of absence due to sickness. Our ‘signal value’ (i.e., the maximum percentage we find acceptable) is 3.2%. In 2015, absence due to sickness in at Gasunie in the Netherlands was 3.15% (2014: 3.09%), which was below our signal value. In Germany, the rate was 3.65%. The Dutch national average was 3.8% in 2014. The 2015 percentage was not yet known at the time of going to press. In 2015, 45.2% of our employees in the Netherlands did not report sick at all (zero absence rate). In 2014, this rate was 50%. We have an active reintegration policy for employees who are ill for a relatively long time. We offer our employees an opportunity to undergo a periodical medical examination once every four years. When our employees report sick, they can state whether their absence is related to their work. In 2015, employees indicated 21 times that their sickness was work-related (2014: 19). In 2015, one report was made to the Netherlands Centre for Occupational Disease (NCB) (2014: 0). In 2015, we started implementing the Dutch Participation Act. Our aim is to ensure that, by 2026, we employ some 75 people with occupational limitations. We are already employing four people from the target group in various positions. In addition, we started a pilot with the W.A. van Liefland School for children with a disability. We also had frequent consultations with other companies in the region to share knowledge and ideas. If the pilot with the W.A. van Liefland School is successful, we will turn the pilot into a permanent project for the years 2016 to 2018. If it is not successful, we will start other pilots to find initiatives that are a better fit for our company. In addition, we want to find, on average, seven extra positions in our company for people with an occupational limitation. In 2016, we will deliver a plan of approach for this. We have drawn up a Code of Conduct, which describes what we expect of our employees in terms of behaving with integrity. The Code includes rules for treating colleagues with respect, ethical issues, bribery and corruption, using alcohol and drugs, dealing with commercially sensitive information, the use of social media, and making telephone calls while driving. Violations of the Code reported in 2015 were addressed and appropriate measures were taken by the management. In 2015, we found zero incidents of bribery or corruption. Following up on the complaint made in 2014 by an employee regarding a possible flaw in a tender procedure, an independent law firm looked into the tender processes at Gasunie. This led to a number of concrete recommendations for improving our processes. These recommendations were translated into actions, which have by now been completed. * A wage scale for young employees that encourages their development by means of a broader remuneration range and more focus on personal development.